I just want to extend my heartfelt gratitude to each and everyone of you who have been faithful followers and supporters of Terry over the past couple of years. It was because of your thoughtfulness, love, genuine concern and continual encouragement to Terry that truly gave him the strength and the drive to write and post his wonderful blogs each day and to share his life with you. He did this no matter if he was having a positive day or a day with a lot of health challenges as a result of his cancer. Needless to say, this has been a very tough time, but you all have helped tremendously to lessen the stress. It was so sad to witness my husband and best friend transition from a person with so much vigor and in the very best of health to one that eventually became totally dependent on me for even his very basic needs. As the weeks and months progressed, he continued to get more discouraging news about the progression of his cancer, but he remarkably remained positive. The poor guy, in his last days, was living with so many drainage tubes attached to him (one in his abdomen for his urostomy bag and the other thru the middle of his stomach due to the inoperable bowel obstruction). He also had one PIC main IV line into his left arm for his total parenteral nutrition, as he no longer could eat anything by mouth, and the other IV line was attached through his main power port for his morphine pump. Also, he was on continual Oxygen thru his nose as well. Each day, I continued to keep up my strength and my hope that Terry could beat his cancer and that it would miraculously go into remission and all would be okay. Just reading your daily comments to Terry each day was a tremendous help to keep up my strength as it gave me great comfort to know that there are so many wonderful folks out there that really cared about us and Terry’s challenges. I can’t express enough in words my heartfelt thanks to you all. As most of you probably know, Terry passed away in our RV on MacDill Air Force Base on Friday, September 1, 2017 at about 2 PM. I was there continually with him the entire time. I held his hand throughout the prior night and could not sleep a wink with fear that he would pass through the night, however God wanted to let Terry awake yet one more morning for one more chance to brighten our day. Although Terry was having difficulties speaking early Friday morning, I was able to do a quick video and to give him the opportunity to say to each of his immediate family members by name that “he loved them”. I wish I could have done a last video with you his fellow bloggers, but Terry was just much too weak and it was so difficult for him to speak. In fact, after doing that brief video, Terry no longer spoke another word although he continue to breath at a slower rate. I held his hand for yet another four hours and then at 2 PM his breath was no longer and he was then on his way to Heaven. Terry truly will be missed by me and there will be a deep void in my life, and I know that there will also be a deep void experienced by you all that got to know him so well through his blogging. I am going to keep his blog site open and continue the annual membership, and maybe someday, it I can get technology savvy, I might one day “carry the torch for Terry” and carry on with his blogs (although Terry of course was much better at this than I will be). In the interim, I want to share with you my personal email: gdrabczuk@gmail.com and my cell phone number 214-405-7114 should you want to email, text or call. I would love to here from you anytime that you are able. P.S. At Terry’s request, upon his passing I was finally able to share his precious blog with his entire family so they could read and enjoy what he wrote throughout the last few years and of course all your wonderful and encouraging comments which will provide them with some comfort that Terry was loved by so many. Also, I was debating if it would be a bit disturbing to send this short video with the last words spoken by Terry where he was telling his family that he loved them (the video was condensed a bit because of its size), but since you all were there with him through all his ups and downs, thought it might be special to you to experience this video. 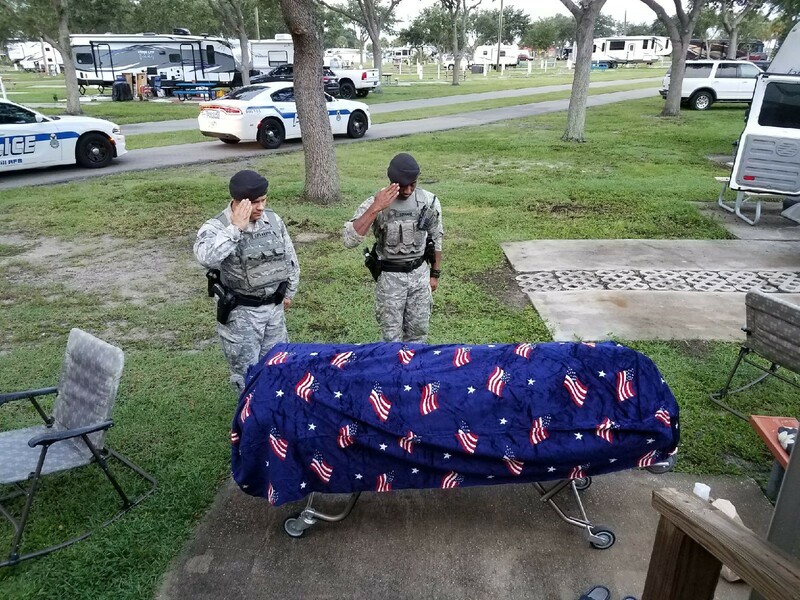 I also wanted to share a nice photo showing the tribute he got from a couple of airmen on MacDill Air Force Base as Terry was removed from our RV for the last time for further transport to the mortuary. Terry, as most of you probably know will be cremated and his remains will be divided between myself and his Mom. Thus, he will eventually have two resting places, one in Midland, TX when his Mom passes and the other with me at my resting place in Arlington cemetery when it is my time. Also, I know Terry will be shaking his head right now as I share a bit of trivia with you about him, but I have to do this…. When Terry was growing up in Midland, TX, he used to live right next door to the the former first lady….. Laura Bush. Okay…..to take this just a bit further, when I grew up in Salem, Massachusetts I lived right next door to Nathaniel Hawthorn’s house…..The House of Seven Gables. So both Terry and I had famous next door neighbors. Okay enough with this trivia ! Need to save some for next time. Have a great Labor Day ! I honestly feel many people don’t want to hear how others truly feel. Back when I wrote that post and up until recently, while in public I would pretend to be healthy, pretend to be happy, pretend to have fun and pretend to be normal. Those days, they have changed. I walk slower and usually am bent over – the lower back is always in pain and walking at times is difficult. Yes, I have been out a little bit to explore the new surroundings in our new location. I take pain medication with me ‘just in case’. While exploring these new surroundings, I see the other people, the crowds of people who are normal, having fun and seeming healthy and happy. I have a sense of bitterness, a sense of hatred because these people are normal and living a normal life. These people are having fun and doing things, going about their lives and enjoying their day, each day. After my exploring of new surroundings in our new location, after walking slower and usually bent over because the lower back is always in pain, I return home. The event of the day, just the walking results in more pain, more pain medication, a bad mood and bitterness. I don’t enjoy my days, there are very few days I enjoy – I am bitter. This has become my new normal life. If you are interested in viewing all the days of November National Days, click this National Day Calendar link to take you to their website. There are some interesting and some important November National Days. Thanksgiving has importance for me this year: I will write about this importance in upcoming posts. I do have another day that I consider important in November – that day is today, November 4. You may remember 3 weeks ago, my 2nd week of my 3rd cycle of chemotherapy was cancelled due to my low white blood count. Last Friday, I met with my Oncologist Dr. D. prior to chemotherapy and it was decided the missed chemotherapy session would not be made up. So, last Friday was the 1st week of my 4th and final cycle. Today’s November National Day is not important to me – instead it is a November Personal Day for me. Today I am receiving my last treatment of chemotherapy. I recognize the importance of this day, but also keep in mind this journey is not over. No, it is far from being over; there is much more to come to complete this journey, this chapter of my life. In the immediately upcoming weeks prior to Thanksgiving, there will be additional doctor’s appointments, more tests, and further diagnoses. But wait – before all those upcoming activities, I sit today in my last treatment of chemotherapy and reflect. I reflect on these past 12 weeks, I reflect on cancer, I reflect on my life and I reflect on the upcoming holidays, I reflect on cancer and the significance it has on me. It is in me in my life for a reason – I believe everything happens for a reason. I may not know the reason for cancer in my life, but I feel I know how I can grow because of it. Cancer is significant to me right now in my life, and because this blog is about my life – there are more posts about cancer and this journey that will come. I sit, I wait, I watch, I ponder, I accept, I acknowledge and then I realize cancer does not discriminate. There are black, white, young and old; a man wearing a dress shirt and tie, the stately woman and the tougher looking guy. Then there is the woman with the pink hair, the majestic woman needing a little extra help, the chatty lady next to me and the young man across from me. Today I sit for hours taking in those around me. Today I sit for hours viewing those near to me. Today I sit for hours receiving chemotherapy amongst others; those around me. I will not have a chemotherapy treatment for 2 weeks and unsure at this time how this will affect my schedule. You see next week would have been my week off and then followed by 2 final weeks of chemotherapy for my 4th and final cycle. Now that I am not finishing the final week of my 3rd cycle I will not know when the 4th cycle will end. You may remember I am making uncertain plans to travel back to Texas to spend with my family for Thanksgiving. With this latest development in my treatment, these uncertain plans become closer to a certainty that the visit will not take place. Thanksgiving with my family – it may be a no go! This is my scheduled week off from chemotherapy and next week will be considered the 2nd week of my 3rd cycle since last week it was cancelled. Friday of next week I will meet with my Oncologist Dr. D. prior to my chemotherapy treatment and should know how the delay of last week’s treatment will affect the upcoming schedule. I am unsure if eventually I will have 3 weeks in a row of chemotherapy or if the regular schedule will take place and therefore pushing my original end date by a week. If the original end date is pushed back by a week, this will certainly affect my trip to Texas for Thanksgiving. My original end date is November 3rd and pushing a week later will be November 11th. With Thanksgiving less than 2 weeks later, it is difficult to determine if my body will be able to handle the travel. The concern I have is whether my white blood count will be back to a normal count as I certainly do not want to expose myself to possible infections when traveling, especially on a plane. Also sometime during the month of November I will receive imaging tests that will determine the future of my healthcare with regards to my cancer. The only important happening this past week is Gary and I moved the RV back to our original location on the Pensacola Naval Air Station. We will now live here at the RV park on the Naval Air Station for the next 3 months. We wanted to be at this location for specific upcoming events such as the holidays and other possible activities. Once the 3 months is over, a determination will take place where the next location will be as this is dependent on my health concerns. Still unknowns at this time and as they reveal themselves the future will become clearer. Why would I watch it? One interesting side effect of the chemotherapy is a couple of days after my treatment, my hands feel greasy; not oily but greasy. They have the feeling of me taking them and rubbing bacon grease all over them, greasy bacon grease. Very strange feeling and I constantly wash them thinking the ‘grease’ will be removed, but to no avail. I received many comments about that post, and certainly appreciate each and every one of them. One of those comments came from Clare over at Around ZuZu’s Barn. If you are unfamiliar with her blog, I encourage you go visit her – she is dear to me. Clare, I did watch “Stand Up to Cancer” and I was emotional the whole time watching. Thank you for your thoughts and wishes and yes, back to chemo this coming week. Happy Sunday! Me, too. But you saw how much hope there is for all of us and that must have made you smile through the tears.. Prior to today I would have never watched this show. Why would I watch it? Cancer has nothing to do with me and therefore the show would be boring and a waste of my time. That day I expressed to Gary I would like to watch it, and he agreed. As indicated in my above comment to Clare, I was emotional the whole time watching. I felt sorrow for others and myself that we are dealing with cancer and having to deal with it in a not so pleasant method. I felt joy and happiness, that advances are taking place and people are recovering from their cancer and living wonderful lives. I felt heartache for those families and friends who lost a loved one to cancer. There is no reason for me to watch this show in the past. Why would I watch it? In the past I did not have cancer and I have no immediately family member who has had cancer, why would I be interested? Today cancer is me and I watched the show with many moments of tears coming from my eyes. As I sat there watching, I wondered if any of my family were watching? I assume they never watched this type of show in the past, why would they watch? Times have changed and now I have cancer – I hope there were a few family members that watched this show. Not because of me, but because of others; the progress being made and those stories that touched my heart. Chemotherapy will begin this Thursday and continue for the next 12 weeks. . . I will keep positive thoughts and faith to create a positive outcome. Dr. P. desires a roadmap before we can proceed with making a decision for the immediate future selection. This roadmap starts with a chest, abdominal and pelvic CT Scan with contrast; then will be followed by a surgical procedure. The CT Scan took place this past Wednesday and the surgical procedure should take place next week. I have an appointment with Dr. P. this morning to discuss the results of the CT Scan. Last Friday I met with urologist Dr. P. at which time he inserted a scope within me to view my bladder and the cancer that is growing within it. After the procedure we discussed the results of my CT Scan performed earlier in the week. Dr. P. informed me that the cancer had spread into my abdominal lymph nodes. There are also multiple lung nodules that need to be further investigated. Dr. P. recommends I be referred to an oncologist for chemotherapy prior to my next surgery. The success rate of stopping the cancer from spreading by having the chemotherapy before the surgery is quite high. Dr. P. also is recommending I have a PET Scan to help identify the lung nodules. I currently am seeing Dr. P. at the Naval Air Station Pensacola hospital. The PET Scan and the Oncologist I will see will be located at a hospital outside the naval base. The PET Scan is not performed at the naval base hospital as well as oncology services. Dr. P. is associated with this outside hospital as well and this will be where my future surgery will take place. Yesterday, I met with my new oncologist Dr. D. and we discussed my health history and the current condition regarding my cancer. Upon reviewing my recent CT scan and the related information from Dr. P., she indicated to me my cancer is stage 4. Patients with stage IV bladder cancer have cancer that has extended through the bladder wall and invaded the pelvic and/or abdominal wall and/or has lymph node involvement and/or spread to distant sites. Stage IV bladder cancer is also referred to as “metastatic” bladder cancer. Thursday of next week I will begin chemotherapy for my cancer that will last for 12 weeks. Depending on the results of the chemotherapy will depend on what will take place next with regards to my treatment. In order to avoid making this a long drawn out post full of details about the possibilities of outcomes regarding my treatment; I will plan to write another post next week about what those possibilities are. The next 12 weeks will involve some powerful drugs being injected into my body to fight cancer. I will have tough days ahead of me. I will have days I will be very tired. And I will have days I will be very inspired. We are starting our 5th full day here in Pensacola, Florida. Today is an important day in that I have my first doctor’s appointment here. My appointment is with my Primary Care Manager at which time a referral will be submitted for a urologist visit; hopefully sometime within a week. Several weeks ago, I faxed a portion of my medical records from my previous urologist Dr. F. in Dallas; I wanted the Primary Care Manager here to be aware of my situation. My hope is this would place an emphasis on the importance of receiving a referral as soon as possible. The completed medical records will be delivered today. My first visit with my Primary Care Manager and Naval Hospital of Pensacola were excellent. I felt very comfortable with my new Primary Care Manager and his urgency to meet my needs were outstanding. The visit involved him learning about the history of my cancer, prescribing medications for my pain and ordering lab work and chest X-ray. He proceeded with the instant referral for me to see the in-hospital urologist. I was amazed with the speed at which this process took place: initially this could take up to a week. Following the visit with my Primary Care Manager I had the opportunity to visit with my new urologist Dr. P.
I am absolutely totally pleased with Dr. P. and I feel extremely comfortable in his excellent expertise from this point on with regards to my care. We spoke about my history of cancer and surgeries for this past year and he discussed the future options available. Before a future option is decided, other activities must first take place. The surgical procedure next week requires that I be placed under general anesthesia at which time Dr. P. will use a scope to view my urinary tract system to determine if the cancer is in other areas besides the bladder. Upon this procedure Dr. P. and I will discuss my options in greater detail and make a decision for my next major surgery. He has indicated the surgery will most likely be scheduled for late this month or early next month. Also depending on the results of the CT Scan and surgical procedure; the possibility of Chemo Therapy may be required. Gary and I are extremely pleased with the response from the Naval Air Station Hospital and my new doctors. I feel very comfortable with our new living location, my new doctors and the possibilities for the future. We’ve all been at the end of our rope, ready to just give up, and a literal storm on a dark day can be just enough to push someone over the edge — but Messina, with help from her producer and friend Tim McGraw, reminds us that it’s just a little water, and we’re thirsty anyway. This defiant anthem preaches taking things one day at a time and remembering that this, too, shall pass. This is my very first post. What should I write that may be of interest to others? Not much and then again maybe I do have many things I can write about. I am an ordinary person, just like many others who live ordinary lives and do ordinary things. I have many opinions about the everyday stuff, some important and some not so important. Most of us have average lives, filled with disappointments and failures and through life we have issues to deal with due to events and other people and with ourselves. So, what makes my life more special than others? Well nothing really. The difference is this is my life that I am writing about. I am 59, a stage 4 Cancer survivor who is blogging because it’s something I have always wanted to do, I enjoy writing and like yourself maybe my words about my life can help others. I have not led a boring life ( Cancer is my exciting life trophy) and don’t know many people who have and your short “bio” does not insinuate you have had a boring life either. What made you say that? Hi, thanks for stopping by and visiting my blog. First of all, congratulations for being a cancer survivor. In my ‘About’, when I refer to boring, I really am referring to ‘tedious’, ‘tiresome’, ‘well-worn’, etc. In my many years of therapy, which included years of group therapy, I realized there are many of us that are the same; experiencing issues and sufferings in our lives that can be tedious and tiresome at times. I read your blog as I read many other blogs from WordPress ‘The Daily Post’ and other sources. I enjoy reading other blogger’s posts, because I can learn something from other people – as I hope they can learn something from me. I continue to believe I am no different from you and others in this world. Sure we have different lives, different locations and different people in our lives, but we truly are not different. Our lives are filled with disappointments and failures as well as successes and wins. I still believe we have average lives; average is not a bad word, it is a midway between good and evil, high and low, happy and sad. Remember this blog is about me and my life. I have experienced many ups & downs, bad things & good things, let-downs & achievements. I still consider my life boring, why? I will never will be president of the United States and I will never be an astronaut and I will never find the cure to cancer. That makes me average, ordinary and my life boring – and that is okay with me. They Need A Haircut..I Might Need A Band Aide! Unauthorized use and/or duplication of this material without express and written permission from this site’s author and/or owner is strictly prohibited. Excerpts and links may be used, provided that full and clear credit is given to spearfruit and spearfruit.com with appropriate and specific direction to the original content. Welcome to my blog. I've started this blog to share my thoughts, help myself come to terms with what has happened to me over the past 4 years and hopefully it will help someone who is reading this.